How do you build a sales funnel just from a WordPress theme and plugins, without having to spend tons of money on ClickFunnels and without being cheesy? I will first show you the themes and then the plugins. If you just want the plugins, scroll down. Building a funnel that converts has been a challenge because WordPress is not naturally set up for this task. Because there are multiple functions, you will need several plugins. If the plugins are from several different companies, chances are they won’t integrate. You mayhttps://funnelxpert.com/best-wordpress-theme/ get plugin conflicts that cause annoying gray pages on your blog and you need to figure out and replace the one that doesn’t work with the rest. You will also have speed problems because of different standards and lazy coding. Do you have all the above for your website? Chances are you don’t. It should be easy to build the components that make up your sales funnel and they should all integrate. You should easily (automatically) be able to place the opt-in forms to the positions where they are the most effective. You should have enough choice to pick the look and the feel of your website so that it fits your niche and your content. You should also be able to build landing pages, or any other pages, with the click of the mouse. At the same time the plugin should have templates available for these, where you can just change the text, change the photo and flexibly add any additional components as needed. All these factors point to the direction that the majority of your plugins and themes should come from the same source. Many people start out with free themes. And these are fine at the beginning, but you will sooner or later need a premium theme. Free themes are infamous for poorly optimized coding. They load slow and every delayed second will result in 7 percent of your visitors leaving your site before it even loads. Many of them are not mobile responsive. They don’t look so good and you don’t have a chance to change around their design if it doesn’t fit your site. And it’s a pain or outright impossible to build a landing page or a funnel with them. Google knows you are using a free theme and it will affect your search engine rankings the same way as if you used a free host. If you know anything about sales funnels, if you ever looked at ClickFunnels or Convertri, then you know that building a funnel with them is expensive. ClickFunnels costs a lot of money… $1,164 per year. What you’re paying for with ClickFunnels is the ability to integrate all the funnel steps within one platform. You need some kind of a happy medium between super expensive and free that kills your conversions. You can either read my complete overview of all the different ClickFunnels alternatives, or you can stay in this post and see how you can build a regular sales funnel using WordPress at a much cheaper price. WordPress is also capable of creating powerful conversion optimized funnels with A/B testing capabilities, the only difference is that you need to go into the third party programs directly to configure them… Which I don’t think is such a big deal if you want to save over $900 a year. An example would be of setting up a payment page in ClickFunnels or Thrive Themes. By connecting your ClickFunnels account to Stripe, you can create a payment page with one click from within your ClickFunnels interface. If you use Stripe with Thrive, you would to configure your checkout page details within the Stripe plugin, and then link to that checkout page. I think the savings are worth it. Now I am going to show you how I created the website you are reading right now. I think it looks great… And it was super easy to create it. Let me show you. The FunnelXpert website is built on the Pressive Theme. Feel free to look around. Pressive is a theme with a distinct character, but the focus is still where it needs to be: on your content, your offers, your conversion elements. PerforMag is the first true magazine theme for WordPress. 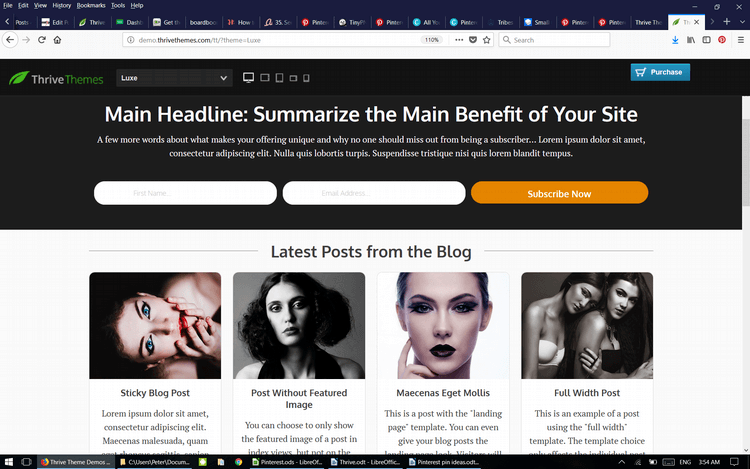 There are many other magazine themes available for WordPress, but unfortunately they only give your site a magazinish look. Performag does a lot more than that. It’s not about the look of your site at all, even though that is also spectacular, it’s about the whole range of machinery that is inside this theme. Performag is built with a different purpose in mind: to increase your site’s ad revenue, increase your social sharing and increase user engagement on your site. In short: it’s streamlined for the business purposes of a magazine website. Rise is a theme for blogging, affiliate marketing and other online businesses. It was built in collaboration with an affiliate marketing veteran, Zac Johnson, who has been a successful affiliate marketer for longer than most of us have even known the Internet existed. You can see actual demos of the different themes, just change the name of the theme in the dropdown menu near the top left corner of the screen. Voice is a theme that emphasizes content & authors. The post author is prominently displayed next to the content, making it ideal for personal branding. At the same time, it’s also about conversion. Minus is a beautifully minimal design theme. Most pages are carefully composed with typography, white space and very little else. This minimal design makes the theme highly adaptable to almost any purpose and any brand. Ignition is a theme that’s very well suited for building a marketing website. With Ignition, it’s a joy to create awesome looking sales pages and marketing pages for your products, memberships and services. 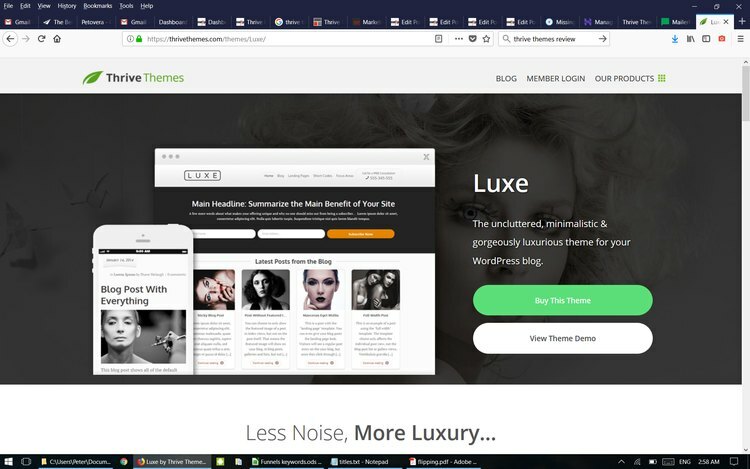 Luxe is a theme that is all about stripping away the distractions and the unessential, and keeping only what truly matters for making your site beautiful and functional. A minimal design style with subtle highlights and typography. 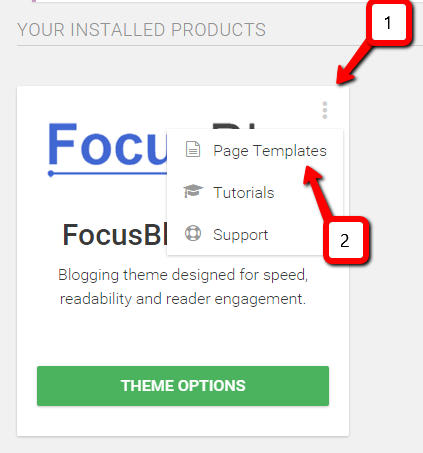 FocusBlog is a multi-purpose theme. You can use it to create a corporate website, a marketing site with landing pages and sales pages, a site for a local business and much more. All these themes are built for speed. Your site should load under 3 seconds. Go ahead and check how fast your site loads in different areas of the planet. Also check how fast my site loads. All these themes are built with a responsive design that fits any screen, search engine and conversion optimized. They are built to increase your mailing list by getting new subscribers and you get fantastic support. 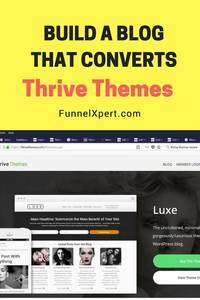 All Thrive Themes are WooCommerce compatible. On all your WooCommerce pages, you’ll find a clean, simple design with a focus on clarity. You will need a free WordPress importer plugin to import your current store. Check out this demo store. Thrive truly makes building a website with WordPress an absolute joy. No cheesy look, and it has all the functionality to CONVERT your visitors. Then check the pages you want to generate. 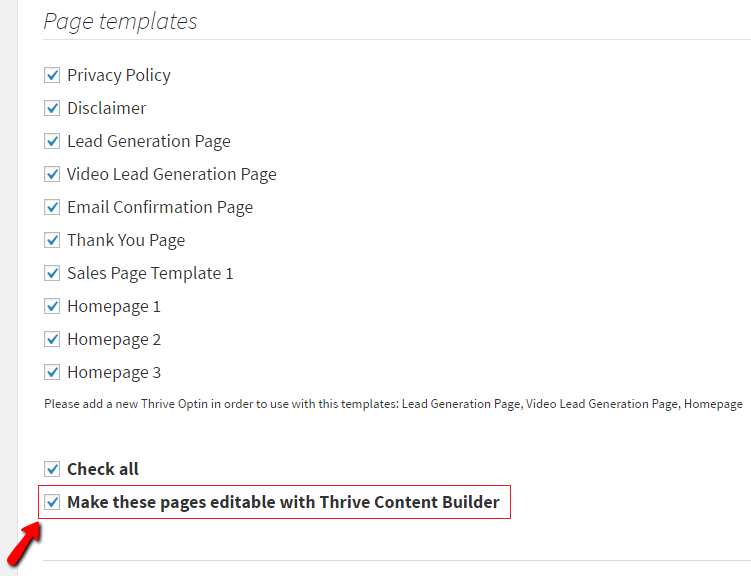 If you have Thrive Architect (formerly called Thrive Content Builder) plugin installed and activated on your website, you can select the highlighted checkbox to make all the selected pages editable with the plugin. The one I am currently using is called Homepage 2. Check out Pressive Theme Homepage 1. Check out Pressive Theme Homepage 3. Check out this Pressive Theme sales page you could have for your product. After you generated one of these impressive-looking, conversion-optimized pages with a push of a button, all you need to do is edit the text per the hints provided, save, and you are ready to go. I am sure you have heard about Neil Patel, the legendary online marketer who has a million dollar blog. He also recommends Thrive and in this video you can take a look at how you can create a homepage (which is really a landing page) just like his. In Thrive you can determine the the size and type of your fonts. There is a setting for H1 and another setting for body text. You can select “Show All Fonts” to list more than 600 fonts, available via Google Fonts. If you don’t have a specific font in mind yet, the sheer number of the available fonts here can be overwhelming. In this case, you can leave “Recommended Fonts Only” selected, which will display a shorter list of high-quality selected fonts. $228.00 Thrive Personal Annual Membership ($19 per month) – this includes all the Thrive themes and plugins. $588.00 Thrive Agency Annual Membership ($49 per month) – this is if you are an agency, and you have the ability to give out the themes to 50 sites that you are selling service to. I personally recommend the $228 Personal Annual Membership, which enables you to use all the themes and the plugins on 25 of your own sites. Annual membership means that for $228 you get support for one full year. After that year, you can still use the themes and plugins, you still get the free updates for them, but you won’t get any more support. Thrive Leads is an all-in-one list building tool. You can build any kind of opt-in forms, you can determine where you place them, you can do A/B testing. Thrive Architect is a drag-and-drop visual editor for WordPress. You can easily add buttons, timers, and a host of other elements to your pages and posts. This includes Thrive Landing Pages. Some companies provide you with a service that includes Thrive Themes products and this way you actually get a discount, since you are getting the service along with the product. Thrive Ultimatum is the perfect scarcity marketing tool to optimize your conversions. Give your visitors an ultimatum that your offer ends soon… Lockdown Evergreen timer, the same for every single visitor. Even if they change browsers, their email address or change devices, they won’t be able to get back their offer price. With Clever Widgets, you can show different content in your widget areas, based on posts, pages, categories, tags and advanced targeting rules. With Headline Optimizer, you can test different headlines against each other. With Thrive Comments, you can get your visitors engaged with comments, upvotes, downvotes, etc. With Thrive Ovation you can get testimonials on autopilot. What you have read above is about to transform into the stratosphere. Thrive 2.0, the Thrive Visual Theme Builder is in beta test version. As you can see, you would be saving the money between ClickFunnels’ $1197/year and Thrive’s $228 for lifetime. But how do you turn this into a full funnel? I have included here a rather long video that gives you a lot of details on how to set it up, this way you will know what you get yourself into if you decide on this route. If you don’t have time to watch the full video right now, you can look at the following post on how your funnel can be set up on thrive. Creating landing pages with WordPress is a pain. With Thrive Content Builder (now called Thrive Architect) you can instantly publish beautiful, conversion optimized and 100% editable opt-in pages, sales pages, webinar registrations pages, etc. At the point of writing this post, Thrive Architect has 233 different templates to choose from, many of these are landing pages. All you need to do is to change the text and the images to whatever you want to. Take a look at the selection of landing pages or my full tutorial on how to build landing pages with Thrive Architect. In setting up your opt-in in Thrive Lead, you can create several lead groups. You can further restrict the categories, posts and pages where these appear. As an example, on this blog I use post footer opt-in forms at the end of the post. I could set it to show a different one for certain posts, pages or categories. You can select from over 40 different pre-made opt-in layouts and you just need to replace the text, add your own image. The asset delivery feature lets you upload files (e.g. PDF reports) to your WordPress site and have those files automatically delivered whenever someone signs up through a Thrive Leads form. The plugin also provides detailed statistics, opt-in percentages for the different kinds of forms. It is very important that your setup works with your favorite email autoresponder service. Thrive Themes integrates with the following email and webinar services. Connecting to these is extremely easy. Rather than connecting each opt-in form by copy-pasting your code, you just need to select your provider from a list in the API Connections menu and enter your API key. From there on you don’t need to mess with any codes when you set up a new lead group, you just need to select the service you already connected and determine the name of the list Thrive Leads should pass on the subscriber data to. If your email delivery service isn’t included in the list, you can still connect by pasting the code into the opt-in form when setting up a lead group. It is important that, if you are a startup, you have an autoresponder company that provides a free-tier service, so that you are not paying $10 or $20 per month for a small amount of subscribers that pay you no money. I know that a lot of people use MailChimp as a free-tier service. While this may work for you, there are a couple of cons. First, MailChimp has a confusing interface to set up your email series automation. This is very general, I had an email list that promoted building a profitable site. 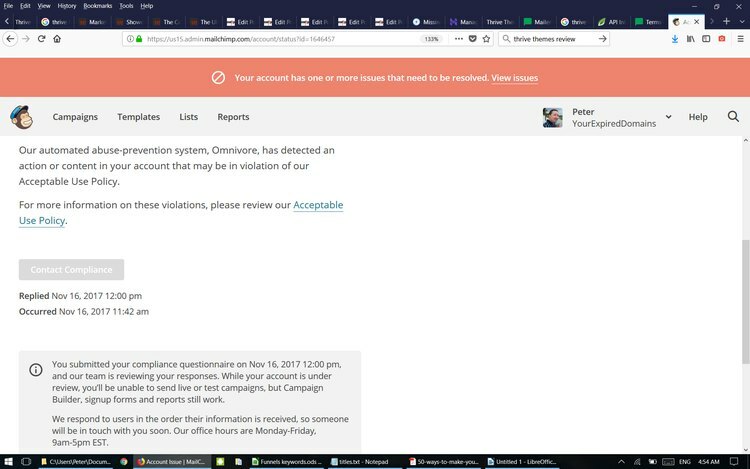 Their automated system banned my ability to send emails just when I started getting some subscribers, and I am pretty certain that the 10 subscribers that I had at that point and the 40 emails that I sent out was not the greatest danger to MailChimp’s existence. After a week’s wait and repeated nudge to their customer service I was told to move my business to a different service. They didn’t quote what part of the agreement I violated. I removed all my content and domains and I asked to re-activate my account, because I wanted to use my account for a different project, but no response after a week again. After another inquiry they resent me the email that said my account was suspended and I should find a different service. Therefore I am not happy with MailChimp and if you do more than sharing recipes or fitness tips or selling e-commerce, you need to assess the danger. Having to move all your emails to a different company is very time consuming. “Affiliate Marketing and Affiliate Links are two different things. Affiliate Marketing is prohibited in MailerLite, but Affiliate Links are fine in most cases. “Affiliate Marketing (Prohibited) – is a type of business where you earn commission by promoting other company’s products. We don’t allow this activity, because there’s no direct relationship between you and your subscribers. You are not allowed to send unrelated offers to your subscribers or pretend to be another brand. Unfortunately MailerLite recently had spam delivery problems and I also had several instances where people weren’t getting my emails, they didn’t arrive into their spam folders either. Another email service you can try is SocketLabs, their free tier allows you to send out 20,000 emails. They also have a plugin that fixes the problem of WordPress not sending out notification emails, or sending these out late. The plugin redirects these through their own system. They have 15 years of experience in delivering email into inboxes. Their suppression system keeps track of undeliverable email addresses, unsubscribed email addresses and email addresses for which a complaint is received. Future messages to these addresses are automatically blocked to increase email deliverability. Thrive Architect also includes a number templates for sales pages like this, and you also have the ability to add pricing tables (see example). Online courses are very popular these days for blog monetization. If you want to avoid paying for a platform like Teachable, you can use the Thrive Apprentice plugin and build a course right on your blog. You can sell your course using a free membership plugin, but you should also have a free tier membership where you can build a membership base and then sell them your product sand courses. This is a not so well known theme that I accidentally ran into that you could consider for building your sales funnel. If you have even less money to allocate for this purpose, this is another option you have. It costs $97 to use for up to 5 sites. I recommend that you look at their showcase of actual websites where the MD theme is used and read their Getting Started Guide. Marketer’s Delight offers a smooth styling that’s simple, yet still looks good. It is fully responsive, works on any mobile device. Instead of having to worry about customizing every little thing, the MD WordPress theme comes nearly ready out-of-the-box. If you’re new to blogging or creating websites, this is incredibly important. You don’t want to spend three days trying to figure out how to configure your theme. MD can create any type of web page or lead page that you’d ever need to. That’s why the theme is a truly all-in-one solution for bloggers and entrepreneurs. The Page Leads system was meticulously integrated into the WordPress admin panel so you can build these content areas on any post, page, category, or custom post type + taxonomy in WordPress. The Funnel Page Lead is the most popular Page Lead bundled into Marketers Delight. Simply designed, the Funnel Lead was built to direct readers to the most important pages around your site. Now, Thrive Theme tends to have more theme options available. But it’s up to you. The best way to decide is to check how fast the theme loads – tools.pingdom.com is a good way. I have seen a premium theme that took 26 seconds to load. Also check the mobile responsiveness and also if you can create the layout that you want to create for landing pages, opt-in forms. Hey, thanks for including Marketers Delight in your post! The benefits of building MD as a complete system is to keep the theme lightweight and loading each feature across your site as efficiently as possible; something lost on many larger plugin page building systems. I hope to see a site of yours built on MD sometime, keep up the good writing!